Our pUrvAchAryas have glorified AzhwArthirunagari greatly in the commentaries. thAmirabharaNi river which runs along this dhivyadhESam is considered as a holy river. To know more about this dhivyadhESam, please visit http://azhwarthirunagari.koyil.org . nammAzhwAr who is praised as prapannna jana kUtasthar (leader of the clan of surrendered SrIvaishNavas), resides along with AdhinAthan emperumAn here and is showering his unlimited mercy upon all of us. Here perumAL enjoys two brahmOthsavams, one during chithrai month and another during panguni month. 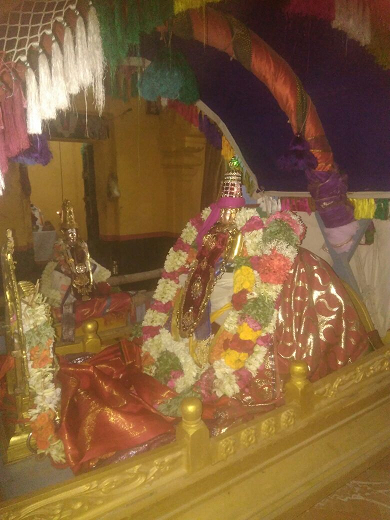 AzhwAr enjoys two major uthsavams, his thiruvavathAra uthsavam during vaikAsi month and divine vigraha prathishtOthsavam during mAsi month, both with hamsa flag hoisting. Further, many uthsavams such as pavithrOthsavam, vasanthOthsavam etc are also celebrated here. adhyayana uthsavam is also celebrated with great enthusiasm. In this bhavishyadhAchAryan sannidhi, there is also an AchArya pItam (mutt) which is coming along in succession. Under the eminent leadership of the jIyar swAmy, the kainkaryams of this sannidhi is happening very well. To know more about this sannidhi, please visit http://bhavishyadhacharyan.koyil.org . Here, every year, emperumAnAr's thirunakshathra mahOthavam is celebrated in a grand manner for eleven days. 4000 dhivya prabandhams are recited in morning and evening sessions during the ten days for the joyful pleasure of emperumAnAr who is seated in an Unjal (swing). On the eleventh day, emperumAnAr enjoys gandhappodi uthsavam and mercifully concludes the uthsavam. The main topic of this article is the chithrai thiruvAdhirai day, which is the sARRumuRai day of this uthsavam. Let us enjoy it a little bit. Usually, perumAL's chithrai uthsavam will also occur during this time. Mostly, it will be fourth day. Sometimes it would also be fifth day. During perumAL puRappAdu in the morning, he stops at the end of emperumAnAr's sannidhi street, and sARRumuRai will be performed. 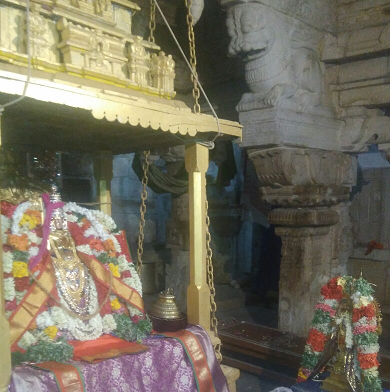 emperumAnAr will be seated in a pallakku (palanquin) and will join the gOshti. 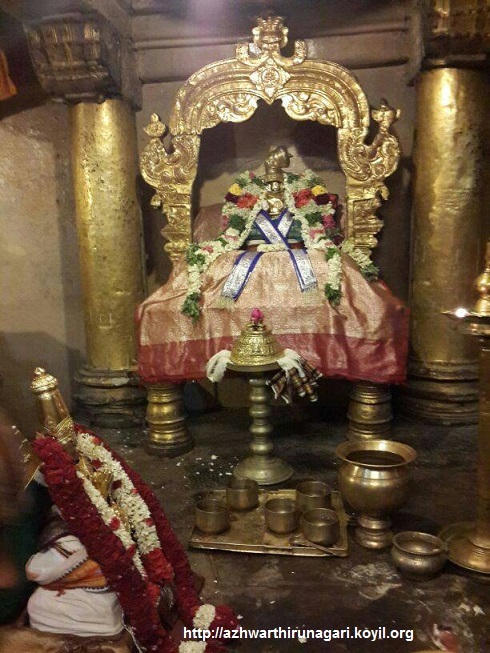 Once puRappAdu completes, emperumAnAr will arrive at the vAhana maNdapam along with perumAL. thiruvandhik kAppu (final Arathi) will be performed and bhOgam (food offerings) will be offered. emperumAnAr will be seated in the same maNdapam where AzhwAr will be seated daily after enjoying thirumanjanam (Note: Only emperumAnAr and mAmunigaL are seated in the same maNdapam - all other AzhwArs/AchAryas will be seated outside the maNdapam only). AzhwAr will be seated facing east and emperumAnAr will be seated facing north. araiyar will recite kaNNinuN chiRuth thAmbu along with thALam (cymbals). archakar will offer thiruththuzhAy to AzhwAr from emperumAnAr's divine hands. Subsequently araiyar recites the glories of AzhwAr. 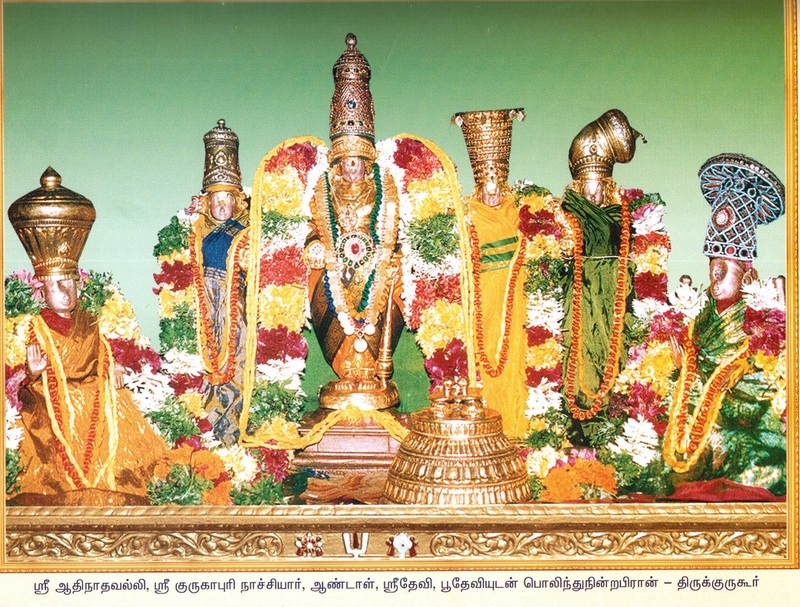 At that time, archakar will present AzhwAr's garland, SrI rAmAnujam (pAdhukA) to emperumAnAr. AzhwAr returns to his sannidhi in kaiththala sEvai (archakars carrying him in their hands) along with chathram (umbrella), chAmara (wysk) and cloth on the ground (this happens everyday). We can be certain that we won't have this experience of performing mangaLASAsanam to perumAL, AzhwAr, emperumAnAr and jIyar - all together at one location, anywhere else. Those who missed experiencing it this year, can plan to be present in AzhwArthirunagari next year and enjoy this great day there.